← Not That Kind of Rock ‘Em Sock ‘Em. 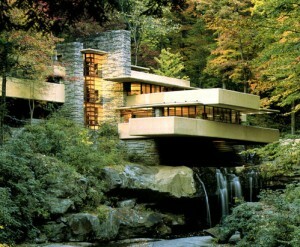 Fallingwater, right, is the Pennsylvania summer home architect Frank Lloyd Wright built for Pittsburgh businessman Edgar J. Kaufmann Sr. It’s widely regarded as Wright’s masterpiece. Seeming to grow out of the very rocks upon which it is set, it was constructed between 1936-1939, and designated a National Historic Landmark in 1966.
is not initially thought of as a material typically used in creating art. But as an architectural artist, it lends itself perfectly to my applications, just as paint to a painter or metal to a blacksmith. I first and foremost do not view my models as literal replicas, but rather artistic interpretations that capture the essence of their sculptural form. Again, my vision is to capture the essence of the architectural & artistic form of the given structure to where my translation almost becomes its pure sculptural form. 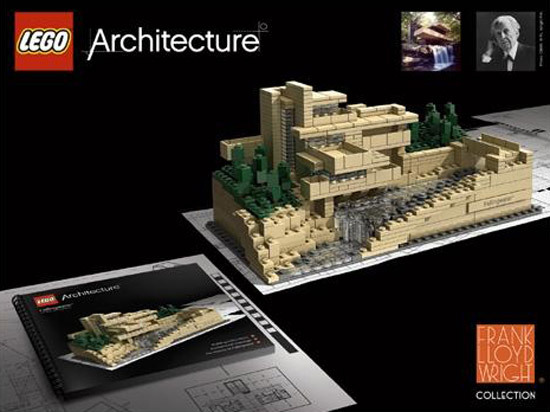 The LEGO/Tucker Fallingwater, roughly 4 x 6 x 8 inches when built, ships in August, and will be available at various museums, specialty shops, and LEGO Brand retail stores. $100. $100? Damnation, and I was going to buy this for my parents for Christmas. Commemorating the two dozen or so Wright houses they dragged me through in my childhood isn’t really worth that much.